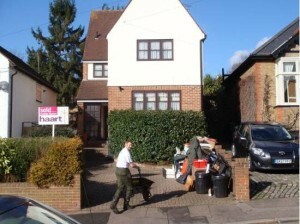 Residents of Poplar need look no further when it comes to local house clearance services. As your local house clearance experts, the Away With It team are available to support you 7 days a week. Our approach is simple – we will clear your unwanted items or waste quickly and cheaply, with the utmost care and respect for you and your property. Our flexible and efficient approach enables you to solve any and all of your house clearance problems with just one phone call. Our returning customers often tell us our ability to offer same day quotes and collections, is one of the many reasons they choose Away With It time and again. With over 15 of years of experience, the fully-licenced and CheckaTrade approved Away With It team has developed an effective system and service that addresses our customers’ needs, providing easy and affordable solutions that the people of Poplar can rely on. Being locally based, we can respond quickly to your house clearance needs – from one item to an entire houseful, you can expect to receive a flexible and stress-free experience. We understand the many reasons behind the need for house clearance and as a result offer a seamless service to ensure this is a problem you can confidently offload to us. Available to you 7 days a week – early in the morning or late in the evening, our friendly team will work with your specific requirements and timescales. After a quick chat about your needs, we will provide a no obligation quote and agree a time for collection that best suits you. If you are concerned about budget, you can be reassured that you will only pay the best price possible. We pride ourselves on being able to provide a budget-friendly service. This is largely due to our rates being based on volume rather than by load, meaning you only pay for what we are physically taking away. Often, other firms will charge you for the entire load, regardless of how much space you use in the van! With our hard-working and reliable team, we are able to clear virtually any non-hazardous waste from your home, whilst maintaining respect for you and your property throughout the process. Professionalism and flexibility is at the heart of our service and you don’t need to take our word for it! We listen to our customers and as a result our customer reviews speak for themselves. To receive your no obligation quote and discuss your house clearance requirements with a member of our team, you can call us on 0208 504 7390 or 07957 123019 or send us a message via our online enquiry form and one of the team will swiftly get back to you. We will listen to your needs and then provide the most suitable solutions to choose from. What’s more, the price we quote is the price you’ll pay!